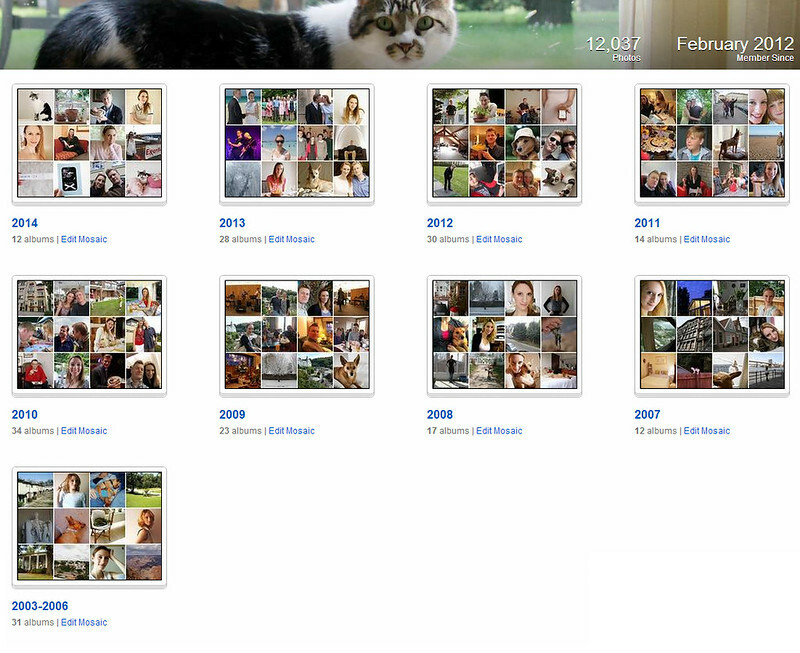 11 years time … 12,037 photos taken. How crazy is that? I have finally managed to back up and organize in chronological order absolutely ALL the pictures I have taken since I got my very first digital camera back in 2003. That’s right, kids, I’m so old I used to have a camera that contained a real physical film that had to be taken to a shop to be developed. Hard to imagine these days. But yeah, it’s crazy how many pictures we take, now that it’s all digital with basically no limit of any sort. It’s quite awesome when you think about it. Things we would have never bothered to snap before are beautifully captured now. It makes for quite a rich and interesting collection. I have organized them all in folders. First by year, then when I click on the years, there are sub-folders by event, or sets. Or when the pictures were more random and scattered, I just stuck them in folders labeled by month. In any case, they’re all in the right order from January to December. And they even include my instagram shots lol Basically ALL my pictures are in there. You can tell it was a slow start between 2003 and 2006, since I had to put those together. I should have taken more back then, but I guess it took me that long to kick the non-digital habit; from back when pictures were only taken on important days. It took me MONTHS to gather them all and organize them neatly. They were scattered all over the place. On 3 different external hard drives, two laptops, my phone, my ipod, 4 different cameras, as well as a ridiculous amount of memory cards and USB sticks. It was a tedious job, to say the least. To my biggest surprise though, not too many seem to have gotten lost over the years. I do regret not having the original large format of some, but at least I still have them. I started thinking about doing this a couple of years ago. But barely managed to keep up with the constant flow of new pictures. Now with our first baby on the way, I decided it was time to get this done. Time goes by so fast. Before you know it, we’ll have 10,000 more pictures. A decade’s worth was already so much work. I can’t imagine how impossible this task would have been one more decade later. I feel so accomplished now. I don’t think many people have their entire life backed up like this. I’m thinking I may also have to start digitizing my physical photo albums from my childhood, so the circle will be complete. But this is great already! Now I can just add my new pictures regularly and keep them nicely organized like that. I have opted to upload them to Flickr. With the future in mind, I don’t think physical hard drives would be the way to go. Hard drives can crash, or break, or go missing. You never know. With everything being online, I don’t have to worry about those things anymore. Plus, the huge advantage of this is that no matter where I am, all I need is an internet connection for me to access them all. I can view all twelve thousand photos on my mom’s iPad when I’m at her place, for example, so she can see them too. Another advantage is that this will be my main tool to tackle my physical albums in a practical manner. I know this sounds totally backwards after what I just preached here. But I’ll leave that for another blog post. For now, I’m just happy this is done. I doubt Flickr will shut down any time soon, so I’m all good for now. Should they ever close, I’ll just have to mass-download them all and re-upload them somewhere else. No big deal. Getting them all in one place and organized chronologically was the hardest part! A regular day at home	Week 26 – Goodbye second trimester!